As your business grows, your computing hardware often cannot keep up. Decreased performance is not always caused by limited processing power. Sometimes the memory capacity of a server can’t handle the increasing demands of a company’s success. 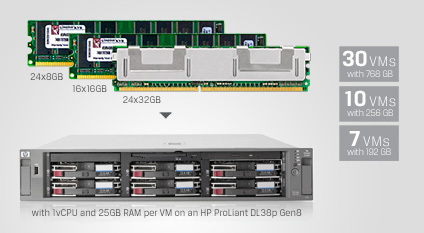 Adding or replacing your servers’ RAM is a cost-effective way to significantly boost performance, while also improving their efficiency—your servers can handle more VMs and distribute their load more effectively. Installing more RAM in your servers can also be far more cost-effective than increasing the number of drives and arrays in a SAN to increase database performance. The test server ran VMware vSphere ESXi 5.1 and the VMs ran Microsoft Windows Server® 2012 Datacenter Edition with Microsoft SQL Server® 2012. PT used the open-source DS2 benchmark, which provides a workload representative of a real-world database application. Each VM, with 1 vCPU and 25 GB of dedicated RAM, ran a large online transaction processing (OLTP) workload. PT also measured power utilization for the three memory configurations. They found that as the amount of memory and number of supported VMs in the server increased, so did the per-workload power efficiency. While running the test workloads, the 192GB configuration used 34.80 Watts (W) per VM, the 256GB configuration used 26.63W per VM, and the 768GB configuration used 13.33W per VM. This makes the 768GB configuration supporting 30 test VMs 62 percent more power efficient than the 192GB configuration supporting 7 VMs. These results demonstrate the significant improvements in performance that a RAM upgrade can deliver, and show that one of the first considerations for a datacenter upgrade should be increasing the memory capacity of your servers.